Friday May 7th 5-11pm & Saturday May 8th, 9am-11pm. Are we gonna see you at the biggest annual event in Allied Gardens this year? We sure hope so. This is the 11th year for SpringFest and we have it going on with lots of new attractions for all ages. Interested? Read on. The Allied Gardens Community Park will soon be transformed into a festival of sights, sounds and fun for the entire family. Our two day outdoor “festival in the park” will once again feature live music from well-known bands, over 100 food and merchandise vendors, a beer & wine garden, carnival rides, inflatables, a rock climbing wall, a parade, a classic car show and demonstrations by various youth and community groups. The signing of our “Support Our Troops” banner. The community is welcome to get involved and offer well-wishes to our troops in the Middle East by signing our banner with a selection of colorful permanent markers. Draw a picture and get creative! The VFW will be on-hand accepting cash donations that will be used to purchase necessities for our troops. The banner will be available for signing Friday night and all day Saturday. Our “Navajo Sings” event where you become the star! We will hold several karaoke singing try-outs beginning at 9:30AM on Saturday at the Demonstration Stage. Top singers will be selected to perform on our Windmill Farms main stage on Saturday night! So if you got the chops, we would love to have you so be sure to stop by and audition. All ages welcome! Two major concerts – Friday and Saturday. Friday night we will host the Air Force Band Mobility doing covers of your favorite pop and rock songs. Bring your dancing shoes because this is a high energy band. On Saturday, we are thrilled to have Rockola back again this year. Beer Garden open both nights. Our beer garden will be open late both Friday and Saturday this year so stay, enjoy the music, eat, and be merry. Thanks go out to Stone Brewing Co. and Ballast Point for heir beer donations and Pal Joey’s for the wine. If you are a musician in a band or know of some local talent who might like to participate in our event, we still have a few openings and would love to get you up on stage. Please visit our website for additional information. 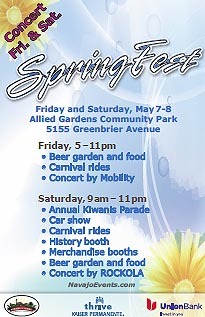 We look forward to seeing you at SpringFest! This entry was posted on April 21, 2010 at 12:10 am	and is filed under Events. Tagged: Allied Gardens, Navajo Community, SpringFest. You can follow any responses to this entry through the RSS 2.0 feed. You can leave a response, or trackback from your own site.